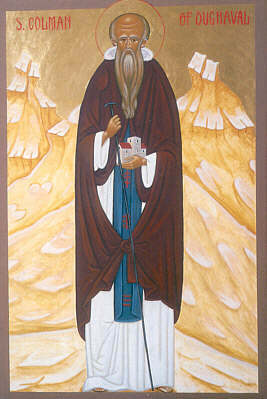 Saint Colman was a disciple of St Columba, Abbot of Iona and St Fintan, Abbot of Clonenangh. In the Martyrology of Tallagh he is included as Colman Mac h Laighsi on 15 May. He was of the family (clan) of Laoighsigh Ceannmoir, son of Conall Cearnach, a celebrated Ultonian hero who lived in the first century. His father was Lugna and his grandfather was Eugene. Their tribe-name was Mac Ua Loighse. IRMOS: When Israel passed through the water as dry land, and had escaped the malice of the Egyptians, they cried: Let us sing to our Redeemer and our God. Being descended from a hero of the ancient times, thou wast born to a life of privilege, O holy one, yet from thy earliest years thou didst esteem the treasures of prayer more than the attainment of worldly glory. Under the guidance and example of our Father among the Saints, the holy Abbot Fintan, thou didst grow in piety and excel in the virtues of our saving Faith. Desiring a life dedicated only to the service of Christ in obedience and prayer, thy spiritual pilgrimage led thee to traverse the ocean to the Athos of the Celtic lands. Our all-merciful God heard thy prayer, O Father, and granted thee the desire of thy heart to remain for many years in thrice blessed cloister of Iona. THEOTOKION: Calm my passions and evil imaginings, O most pure Virgin; my mind is erring, set me on the right path. IRMOS: Thou art the strengthening of all who come to Thee, 0 Lord, Thou art the Light of those in darkness, and my spirit sings of Thee. Christ our God was the brilliance in thy life, making thy monastic cell as expansive as the universe. Joyfully following the disciplines of the angelic life under our most renowned and glorious Father of Ascetics, the great Columba, thou didst shine in the virtue of obedience. Adorned with the heights of humility, yet feeling the call of thy homeland, thou didst seek the advice of the archpastor of thy life. The demons wailed and lamented at their failure to lure thee from the Royal Road of true piety as thou, O Father, didst confound their soul-destroying schemes. THEOTOKION: The Creator came and dwelt in thy womb, all-spotless one; we sing to thee in faith and thanksgiving. SEDALION Tone 4: Thou didst overcome the subtle passions of the flesh and subdue the lower things to the higher. O glorious Father Colman, by fasting thou didst destroy the crafty scheming of demons and illumine the world with the shining radiance of virtue like a sunbeam. THEOTOKION: O Virgin Mother of God, thou art an unassailable wall for us Christians; when we fly to thee for shelter we remain unhurt, and when we sin anew thou dost intercede for us. Wherefore we give thanks and cry: Rejoice, thou who art full of grace: the Lord is with thee. STAVROTHEOTOKION: Immaculate Virgin, Mother of Christ our God, a sword pierced thy soul when thou didst behold thy Son and God wilfully crucified. Wherefore, O blessed one, do not cease to pray to Him, that He may grant us the forgiveness of our sins. Bowing down before the revered Elder, thou didst ask our Righteous Father Columba, 'How can I return to my own land since I would no longer be able to confess my sins to you the shepherd of my soul'. With a deep spiritual insight the God-bearing abbot replied, 'Go to that pious man whom I see standing among the Angels and before the Tribunal of Christ, on each Saturday night'. In thy humility, O Saint, thou didst venture to enquire, 'Who and what sort of man is he?'. THEOTOKION: Thou art a spiritual meadow, O Ever-Virgin, for thou hast brought forth from the furrows the Ear that feeds all creation. IRMOS: Enlighten us by Thy commandments, O Lord, and by Thine uplifted arm grant us Thy peace, O Lover of men. 'There is a certain saintly and handsome man in your part of the country', explained the Elder, 'whose complexion is florid, whose eyes are brightly sparkling and whose white locks of hair are thinly scattered on his head'. 'But', O Father, thou didst respond, 'I know of no man answering this description in Leinster save for the venerable and beloved Abbot Fintan'. 'He it is, my son, whom I see before the tribunal of Christ, as I have already told you. Go to him, for he is a true shepherd of Christ's flock and he will bring many souls with him into the Kingdom of Heaven'. THEOTOKION: All-spotless sovereign Lady, heal my diseased mind, for thou didst give birth to Christ the Physician. IRMOS: I will pour out my prayer to the Lord, and to Him I will confess my grief: for my soul is full of evil and my life hath drawn near to hell, and like Jonah I will pray: Raise me up from corruption, O God. Having subdued thy body through fasting and ascetic labours, O holy one, thou wast found worthy to receive the blessing of the radiant Elder Columba who looked into thy soul seeing thy purity. On once more setting foot in thy native Leinster thou didst go straightway to the holy Abbot Fintan and, having prostrated before him, related to him all that Iona's Elder had said. O what an example of humility was vouchsafed to thee, O holy one, by Fintan's injunction not to report these things in his lifetime. THEOTOKION: The Lord is with thee, O most pure one. For it pleased Him to dwell in thee, O Maiden; and through thine intercessions we are delivered from the dominion of hell. Therefore we magnify thee throughout the ages. Shining bastion of the Faith and warrior against the passions, O Father Colman, thou art the adornment of Oughaval, where following the guidance of the great abbots Columba and Fintan, thou didst establish a monastic beacon to illuminate Leinster. We honour thee, we hymn thee, and we praise thy name rejoicing in thy glorious memory. IKOS: With a loving attachment to Christ's commandments and a distaste for worldly pleasures, thou bast persevered to the end and become a shining light illumining the ends of the earth. Wherefore I fall down before thee crying: Enlighten my spiritual sight that I may praise thine exploits of fasting, vigil, weeping, labours and bodily afflictions for the sake of the Life to come in which thou now rejoicest. Pray for us without ceasing. IRMOS: Having arrived in Babylon from Judea, the Children of old by their faith in the Trinity trod down the flame of the furnace, singing: O God of our fathers, blessed art Thou. Following the noble example of our Father among the Saints, the Righteous Pachomios, whom we also joyfully celebrate today, thou O Father didst retire to the desert to build cells for the Athletes of Christ our God. By thy fervent prayers thou didst put the demons to flight cleansing Oughaval to become the sanctuary of our Most Blessed Saviour. Sowing the seeds of piety, O Father, thou didst reap the rich harvest of souls thirsting for the pure waters of salvation. THEOTOKION: Thou hast given birth to a new Child - the Eternal Word; thou hast renewed us who have grown old through sin, and thou bast strengthened us to sing: O God of our fathers, blessed art Thou. IRMOS: Inspired by God, the Children stood in the midst of the flames and sang: Bless the Lord, all ye works of the Lord. By the power of thy prayers, O Father, Oughaval shone forth as a beacon bringing the light of the True Faith to the remoteness of Erin's green desert. And the Host of Angels, on beholding thy shining victory in the angelic life, cried with heavenly joy 'Alleluia'. The demons were routed by thy witness, O Father, as the pagan darkness of the old religion gave way to the brightness of the revelation of Christ's saving grace. THEOTOKION: All who turn to thee are filled with grace, and are cleansed both in soul and body, O Virgin, for thou art an ever present source of refreshment. IRMOS: Creation was filled with dread on hearing of the ineffable condescension of God, that the Most High came down voluntarily and became incarnate of the Virgin: therefore the all-pure Mother of God we magnify. By the Grace of God many sick and troubled souls received help and healing by thy intervention and thy prayers, O holy one. The Angels wept when thy precious sanctuary was overrun and destroyed by those wicked barbarians, the enemies of Christ our God. Long centuries of darkness clouded the memory of thy glory, O Father Colman, leaving thee with no shrine for thy precious relics, the whereabouts of which are known only to God, and no church dedicated in thy honour. Now the Faith of our ancestors is rediscovered, thy memory is renewed, thy devotion is restored and thy likeness is brought forth once more, O Colman our Father, Teacher and Guide, and like the woman in the Parable we can truly say, 'Rejoice with us for we have found that which was lost'. THEOTOKION: Enlighten my heart which ever grieves over my transgressions, O Virgin, and do not abandon me to my enemies on account of my worldliness, that I may glorify and lovingly hymn thee, O all-praised Lady. EXAPOSTILARION: Thou didst flourish like David's palm tree and become a dwelling of the Holy Spirit, thou art famed throughout the universe. Ceaselessly pray for us who revere thee in faith, O Holy Father Colman. Glory to the Father and to the Son and to the Holy Spirit, Now and ever and unto the ages of ages. Amen.